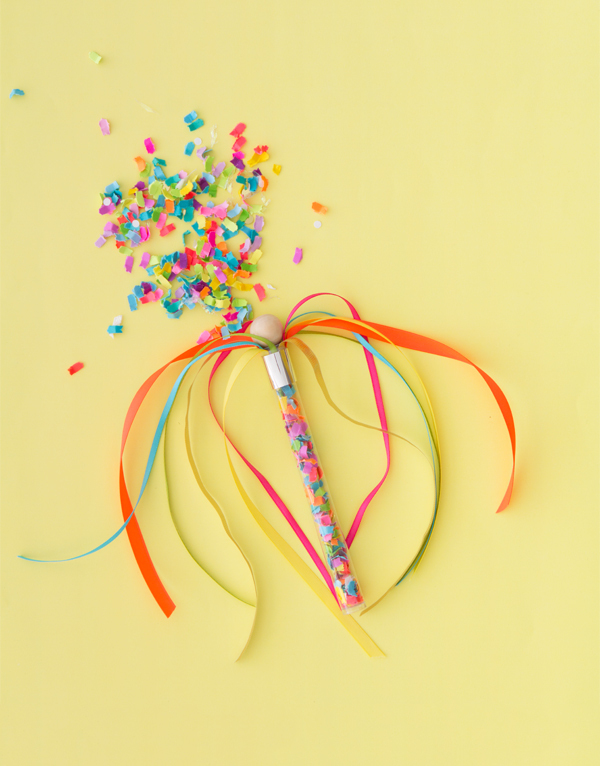 May is just around a corner and an old tradition that we LOVE at Oh Happy Day is the May Day ‘Maypole’ (pssst… have you seen our Maypole DIY?). 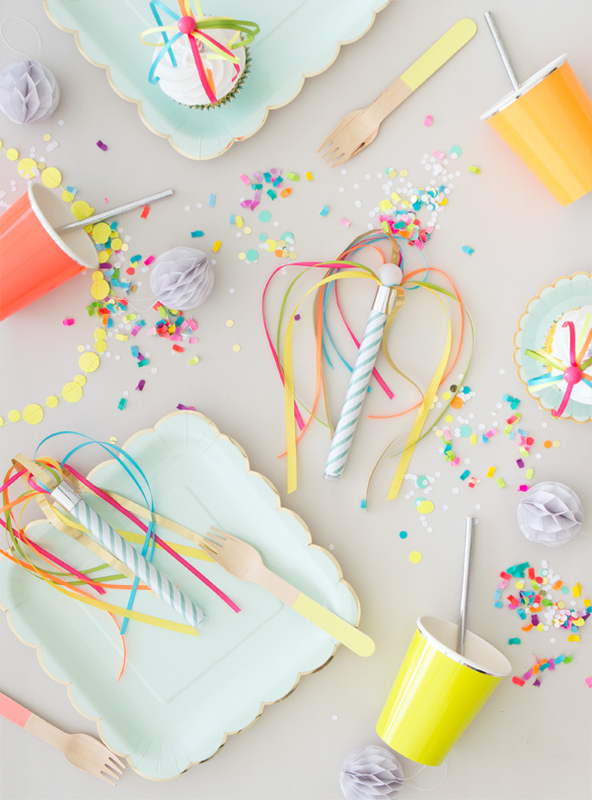 Inspired by this beautiful concept, I thought it would be super cute to make mini versions and turn them into confetti favors. 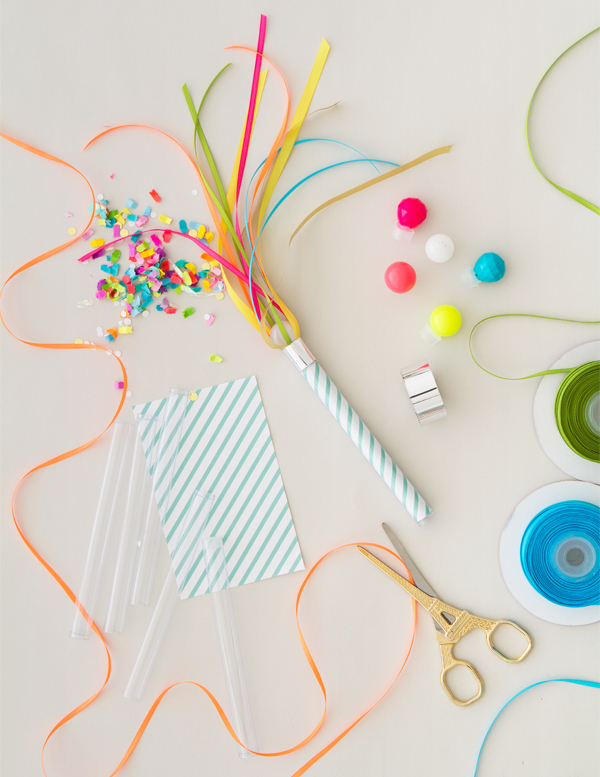 Perfect for your guests to spread some bright color around at your Spring parties! Side note: We love the Maypole so much we created a second ‘Maypole’ inspired project which will be up later today! Stay tuned! 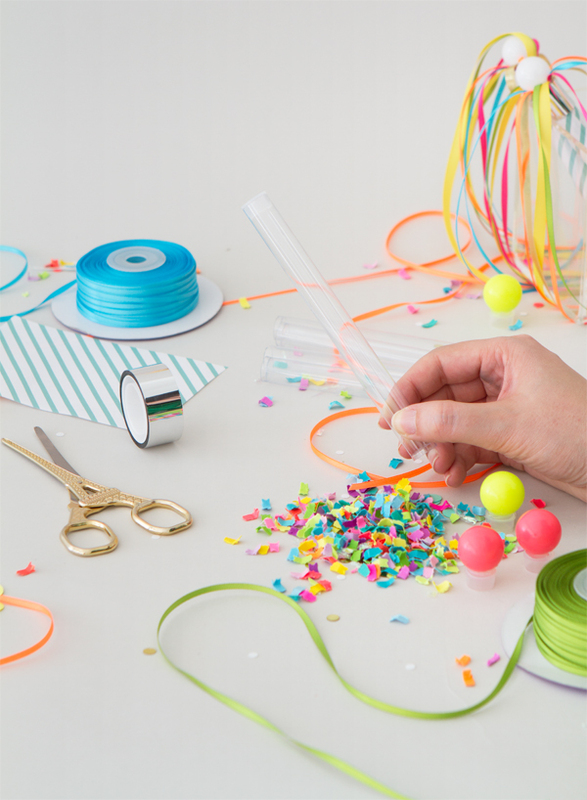 Materials Needed: 6” bead storage tubes, approximately 7/8” beads, hot glue gun, 1/8” and 1/4″ ribbon in 6 colors, scissors, ruler, Scotch tape, opaque tape (washi or Scotch Expressions would work), stripes printable (and access to a printer and standard printer paper), Adobe Reader, mini confetti. Step 1: Affix a bead to the top of the storage tube using a dollop of hot glue. Hold until glue has cooled. Step 2: Gather two strands of ribbon of each color at 9” lengths. Step 3: Take a 5” strip of Scotch tape, and begin wrapping along the top edge of the tube. Starting with the thinner ribbons, adhere the end of each strand to the piece of scotch tape, wrapping around the tube as you go along. Remove any excess tape. Step 4: Wrap a layer or two of opaque tape over the Scotch tape to hide the mess. Step 5: Open up printable in Adobe Reader then print and cut out. Roll the paper into a scroll and insert into the tube. 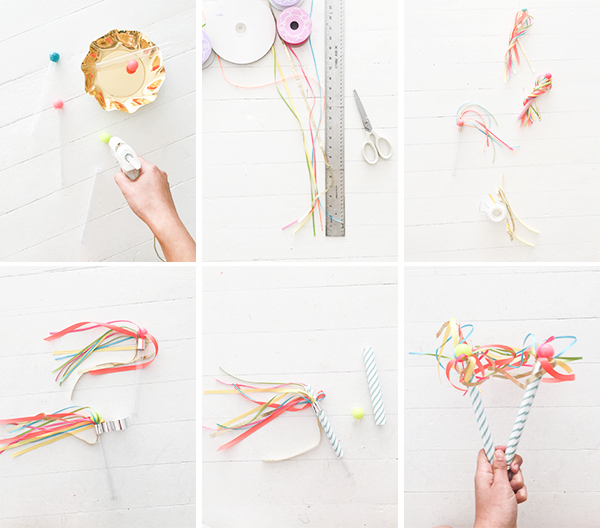 Step 6: Fill your maypole with treats! 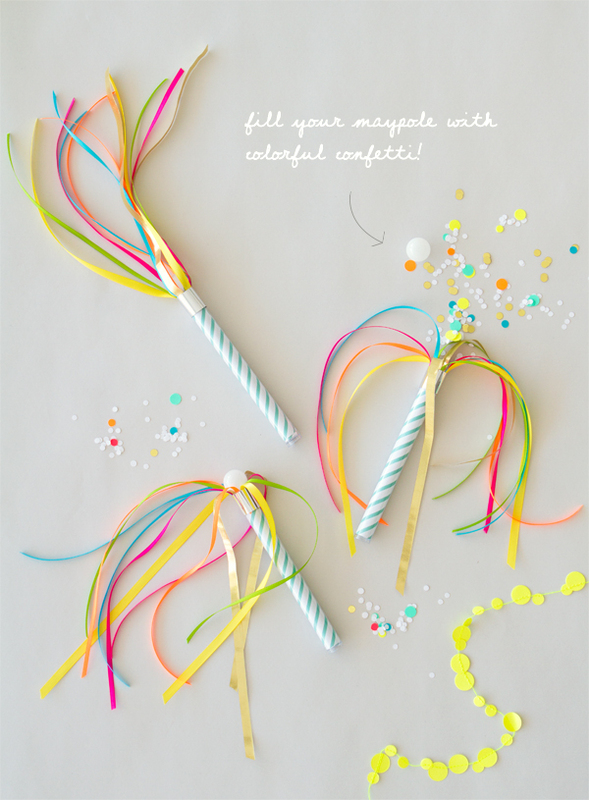 Above is a version of our Maypole favors sans stripe printable. 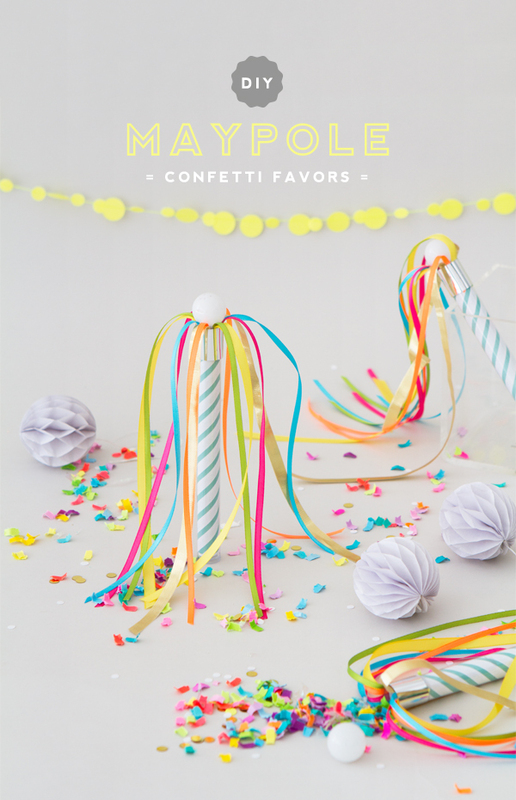 It reminds me less of a Maypole but I thought I’d show you the idea because I just love seeing the colorful confetti inside! I feel like I need to have a May festival now!